Insolroll has been making patio shades since 1986. Since then, their patio and deck shade products have been branded under the Oasis® brand name and evolved into four different hardware systems to address a wide variety of applications. These specialized patio shades let homeowners either keep your view or enhance their privacy. Our Oasis 2800 Patio Sun Shades and Oasis 2900 Retractable Insect Screens have been redesigned to accommodate the Lutron Electronic Drive Unit (EDU). They now integrate seamlessly with Lutron Homeworks QS®, Radio RA 2® , and Caseta® Controls. The ultra-quiet, precision-controlled EDU controls the movement of a shade, keeps track of the shade’s position and adjusts the shade to the user’s desired preset positions. The Lutron Electronic Drive Unit provides smooth, silent starts and stops. Oasis Patio Shades Driven by Lutron are the perfect outdoor sun control solution for the luxury home market. Lighting control integrators can easily connect the shades to Lutron Homeworks, Radio RA2 and Caseta controls without workaround required for non-Lutron motor solutions. Insolroll utilizes the powerful 24V low-voltage Lutron Roller 300 EDU making wiring easy and connectivity with Homeworks perfect. Shades can also be controlled with stand-alone Pico Radio Remote Control wall switches and hand-held remotes. Oasis® 2800 Patio Sun Shades are a sun control solution for covered patios and pergolas. You can select a side track or cable guide system that does not capture the edges of the fabric, but interfaces with the hem bar to provide sway control in breezy conditions. Oasis 2800 Patio Sun Shades are designed to provide shade from the sun when the outdoor living area is in use and should be retracted when not in use. The maximum size for these shades is 16′ wide x 10′ high. Oasis® 2900 Retractable Insect Screens provide insect protection for covered patios, garage door openings, and retractable glass walls. The edges of the fabric are captured by our Shy-Zip sidetrack system. The Shy-Zip system serves to keep pesky insects out and also secures the fabric in windy conditions. 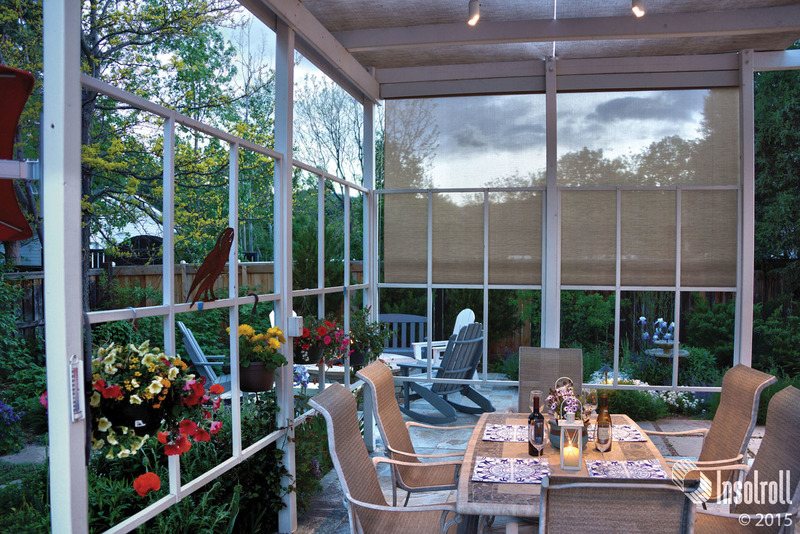 Oasis® 2900 System is available with fabrics for insect protection only or with alternative fabrics to provide additional sun control, privacy, and patio enclosure benefits.